I haven’t paid much attention to electric guitars lately but then I saw this beautiful looking Tacoma Stratocaster and I couldn’t resist. 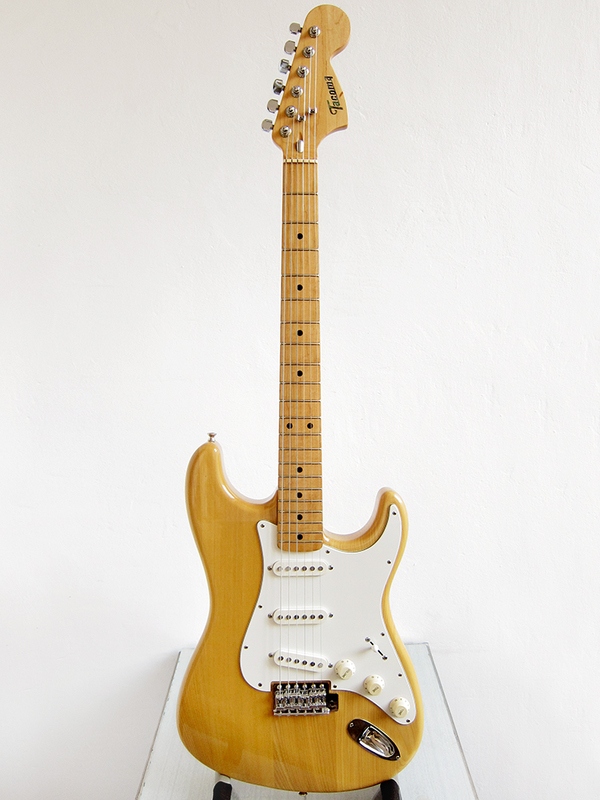 I actually had a natural wood coloured Japanese Westone Strat that I really liked but sold last year since the neck profile was a bit too flat for my liking. This Tacoma has a neck profile right up there with my Tokai Silver Star SS-36 and my Fender Stratocaster, both made in 1979. I got confused when I bought this Tacoma, the auction was ending and I didn’t have time to do my research. I really thought that Tacoma had something to do with Tama for some reason, but apparently not. The only thing related to Tacoma that I have found so far is that Wutzdog guitars in Germany has two Strats from the mid 1970’s for sale and neither match mine. Mine has a fancy pants real inlay logo on the headstock while theirs have printed logos but then at least one of theirs have grey bottom pickups which I wished mine had too, my Tokai Silver Star SS-36 has that and they sound awesome. This Tacoma has some weird looking brass plate in the bottom but that might good too, I haven’t had time to play this properly through my Fender amp yet. Either way I really like this guitar and the neck is just a pure joy to play. I assume the guitar is from the late 1970’s considering the big head and feel of it, but who knows, they might have made Fender copies in the early 1980’s too. There is an American guitar company called Tacoma but I doubt that they have anything to do with these old Japan made guitars. If anyone knows anything about Tacoma then please get in touch. The wood is in great shape and it has a nice weight to it. This is the first time I’ve seen single coils with those heavy brass plates. After a bit of research I’ve come to think that perhaps my Tacoma was made by FujiGen. The guitar on the left is a Yamaha Super r’n Roller SR-400 and what I gathered they were made by FujiGen in the 1970’s. The guitar in the middle is an early 1970’s Matsumoku built Univox Strat. On the right we have my Tacoma and even though all three looks very similar I still think that the Tacoma and the Yamaha has the most in common.